Furi update on Steam with speedrun in Furier! 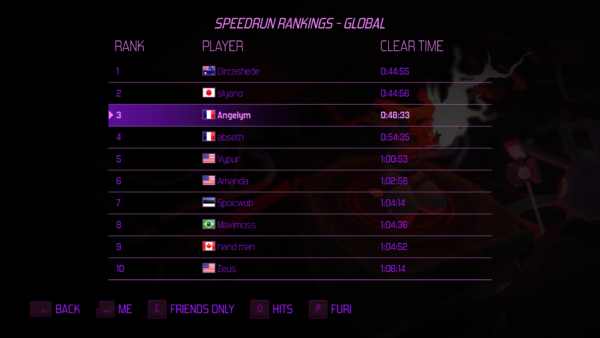 We just updated Furi on Steam with the official Furier Speedrun mode, with leaderboards. Update 1.4.116 is available for anyone who owns the DLC “One More Fight” (The Flame and Bernard are part of the speedrun). A whole new challenge awaits… We’re really looking forward to seeing the wonders you can do in this mode! At the same time the game is 50% off today, as Daily Deal. That puts it under 10 € / $. The jailer is the key, parry-charge-dash-parry and you will be free. Furi Freedom Update available now – time to get started on the game? Offre de stage test / Q.A.